Preheat the oven to 350. Oil or butter a two quart baking dish or gratin pan. If the bread is soft, as mine was, toast it lightly and then rub each slice front and back with the halved garlic clove. 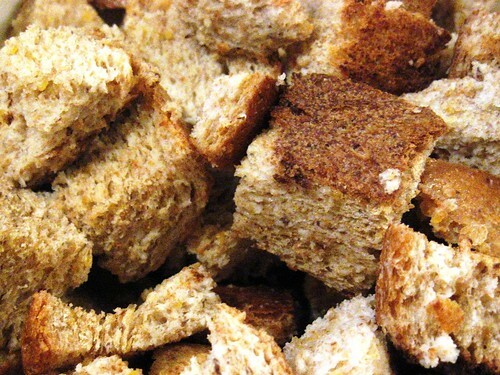 If your bread is really stale, you can skip the toasting. Cut into 1 inch dice. Place in a large bowl and toss with 2/3 cup of the milk. Set aside. 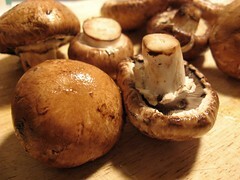 In a large skillet, saute the mushrooms in the butter for 2 to 3 minutes, just until they smell good. Remove from skillet and set aside. 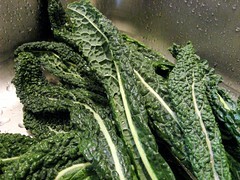 Add the still wet kale to the skillet and cook over medium high heat until it starts to wilt. Cover the pan and let the kale steam until it has collapsed, about 5 minutes. Add more water if needed but just enough to steam not boil it. Uncover and stir. When all the kale has wilted, remove from the pan and rinse in cold water. Squeeze to get out the remaining moisture and then chop and set aside. Add 1 tablespoon of the olive oil to the skillet and quickly saute the minced garlic over medium heat. 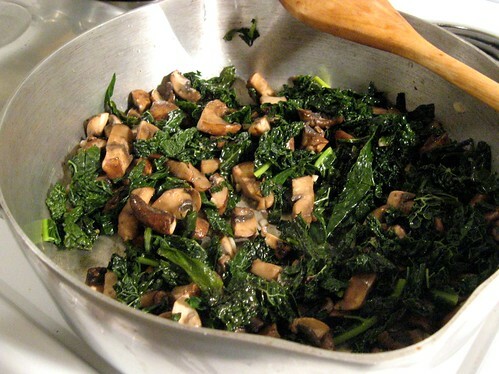 Stir in the mushrooms, rosemary and kale. Stir together and season with salt and pepper. Remember that the cheese and bread both have salt in them so adjust your seasonings with that in mind (my dish turned out slightly too salty because of this, I think). 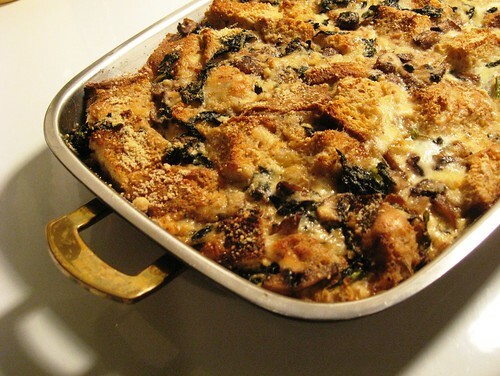 Remove from the heat and add the kale mixture to the bread cubes. 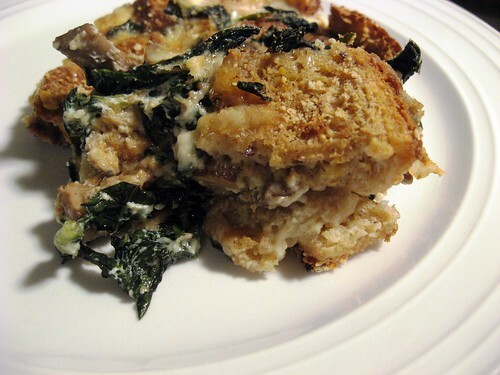 Add the grated cheeses (not the Parmesan, that comes later), toss to mix and then arrange in the prepared baking dish. Beat the eggs in a medium bowl. Add the remaining milk, the 1/2 teaspoon of salt and some freshly ground pepper. Pour over the bread mixture. Press the bread down into the eggs. Sprinkle the Parmesan on the top and drizzle the other tablespoon of oil on top of that. (The oil thing is in Martha's recipe. I have to admit that I couldn't tell there was oil there and will probably not waste the effort next time I make the dish.) Place in the oven and bake 40 to 50 minutes until puffed and browned. Serves 4 to 6. Martha says you can do all the hard work ahead, up to the egg step, and it will keep, covered, in your fridge up to a couple of days. Add the egg and milk when you're ready to bake. Next time I make this I will probably halve the recipe and bake it in a small dish. It's way too much for one person to dispose of. I'll likely let the bread sit out to get a little more stale before toasting. And as I said, I will cut the salt a little bit. The crimini were fabulous, great flavor. It was, however, the rosemary that really made it. I need some help translating an ingredient in a German recipe for Rosetta rolls. The word that has me is "proteinweizen." I'm guessing it means "wheat gluten," but I'm not sure. New Norcia Sourdough and an Unusual starter. Related post in General Discussion forum. (i.e. bubble) and have a sweet/sour pleasant aroma. using within four hours, refrigerate. and 250g flour. Pour off excess starter before feeding. half to two hours until soft and puffy. a quarter hours until golden brown and tested hollow. Read more about New Norcia Sourdough and an Unusual starter. I live in the UK, and purchased a copy of Peter Reinhart's Whole Grain recipes book as soon as it came out on sale. I was really looking forward to his book, and trying out complex, wholegrain flavour breads. However, every recipe i have tried so far has came out too sweet, and my biga and poolish always come out too wet, much wetter than the consistency in his pictures. Has anyone else had a similar problem with Peter's recipes? Am I doing something wrong? So I'm writing a recipe for everyone. 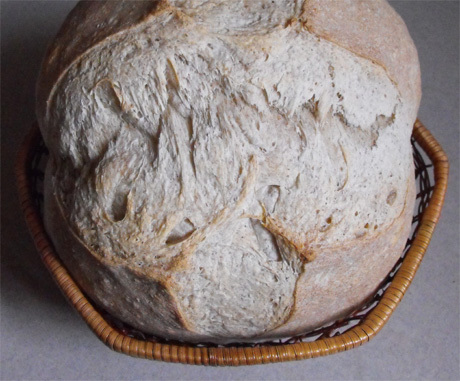 Its intended so that anyone, regardless of experience can try to make bread. So far, I've been told that the recipe reads as a technical document. As yet, I'm not sure if thats a good thing or a bad thing. But please read and tell me if its not detailed, too detailed, or in general too wordy. Instant yeast can be mixed directly in with the flour, bread machine yeast works, but if all you can get is active dry yeast use 1.5 tablespoons, and proof it in water with some sugar first, it should bubble (use some of the water you have measured for the bread). Water at around body temperature is great, around 80-90F (25-30 C), but any hotter and you risk getting the water too hot for the yeast. Use your finger as a thermometer (finger test! ), if you can't tell if the water is hot or cold, use it. 2.) Measure out all your ingredients. Mix the flour and yeast in a large mixing bowl, then mix in the salt. 3.) Pour the water and melted butter into the mixing bowl on top of the dry ingredients. 4.) Using one hands, scoop and fold the ingredients in the bowl; with the other hand continuously turn the bowl. After a few minutes the dough will come together into a sticky mass. 5.) Turn the dough out onto a table and knead the dough by stretching it away from you and folding it towards you. 6.) Seal the fold by pushing the dough against the table. 6.) After sealing the fold give it a quarter turn (turn it 90*) and repeat until the dough is smooth and tacky. You will know the dough is finished when it is smooth, and just slightly grabs your fingers (tackiness). By this time your hands should be no longer covered in dough (the gluten has settled). 11.) Beat one egg with salt to make egg wash. When baking, you must always bake it until it is done! I have done much research on TFL and all over the web (two weeks)and I am not seeing the solution to my quest. I have the Hamelman bread book on reserve at the library and I hope it will teach me a lot about how to design a proper recipe, as I see it is often referred to on TFL & elsewhere by skilled bakers. They were completely sourdough, but something wasn't quite right. They got a bit too puffed. I'm thinking that the fact that I let the dough come back up to room temperature had something to do with that. I should've boiled straight from the fridge, then baked. It could also be that I didn't get them stretched out quite enough, either. The taste, though? Perfect. Exactly what I want. Which is the one BEST Bread Book for recipes/formulas. Not a technique book or how to but the actual formulas for great bread. Which one book, has the most, the tastiest recipes ? Instructions on bread baking 101 not necessary, if it has that's ok but not essential by any means. Read more about Which is the one BEST Bread Book for recipes/formulas. Not a technique book or how to but the actual formulas for great bread. Thanks for all the help I have gotten browsing this site already. 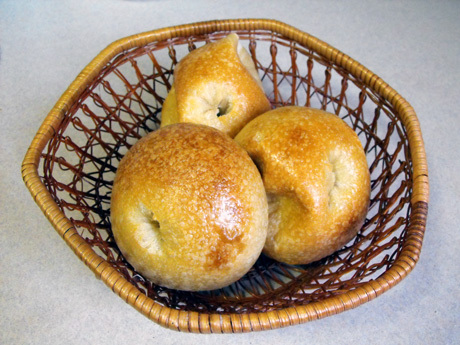 I have been making bread by hand for about a year and decided to get some starter when I heard about Carl's 1847 Oregon Trail starter.